“Fabio Fabbi studied painting and sculpture at the Accademia di Belle Arti in Florence, in the studio of Augusto Rivalta, and won several prizes in both disciplines during the early 1880s. He then visited Paris, Munich and Egypt. When he returned to Italy he devoted himself solely to painting. In 1893, he was teaching at the Accademia in Florence, and in 1894 he was a member of the Accademia di Belle Arti in Bologna. He was decorated with the title of knight of the crown of Italy in 1898. Fabio Fabbi painted a few religious pictures, but he mostly chose Middle Eastern themes for his subjects: odalisques, markets, bazaars and harems. He also designed medals. 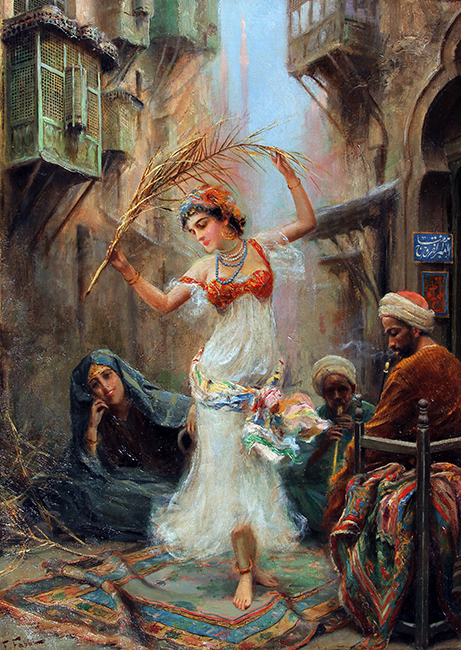 The style of his paintings varies according to the technique used. In his pastel works, form and movement are merely suggested by a few strokes of the chalk, whereas his oil paintings on ivory are more boldly executed. He chose the medium of watercolor to illustrate new editions of the Aeneid, the Iliad and the Odyssey. He took part in various exhibitions including exhibitions in Monaco, in Turin from 1884 where he won a prize in 1899, in Florence in 1888, and in Milan” (Benezit, Dictionary of Artists, Gründ, 2006). Please contact us if you are interested in selling your Fabio Fabbi paintings or other artwork from the 19th century and early 20th century.